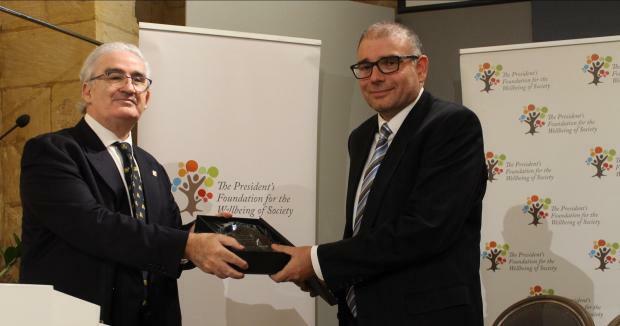 Prof. David Attard, University of Malta Chancellor (left), presenting Dr David Zammit with the award. The head of the University’s Civil Law Department, David Zammit, has been named the winner of the inaugural Malta Human Rights Award for an essay entitled ‘Vernacularizing Asylum Law in Malta’. Dr Zammit, who specialises in anthropology and the Law of Tort as well as being executive editor of the Mediterranean Journal of Human Rights, published the contribution after carrying out detailed ethnographic research into the legal and bureaucratic processing of boat people in Malta. The announcement was made on Friday at a annual human rights conference entitled ‘Trends and Perspectives’, held at San Anton Palace and organised by the Human Rights Programme in partnership with the President’s Foundation for the Wellbeing of Society to mark the 70th anniversary of the Universal Declaration of Human Rights. The award was instituted by the Human Rights Programme of the Faculty of Law within the University of Malta. Speakers at the conference included President Marie-Louise Coleiro, and keynote lecturer Vincent De Gaetano, Chief Justice Emeritus and Judge of the European Court of Human Rights. This year’s edition focused on the impact of human rights on the development of law and other disciplines at University, as well as inaugurating the annual Human Rights Award for academic publications that ‘inspire a better understanding, diffusion or implementation of fundamental human rights and which have particular relevance to human rights scholarship in Malta’. Eligible entries included dissertations, books and academic articles, chapters in books and essays. Dr Zammit’s essay analyses how official structures, procedures and statuses are implicated in producing and re-producing grassroots’ social perceptions of migrants as abusive recipients of humanitarian charity instead of being subjects of legal rights.